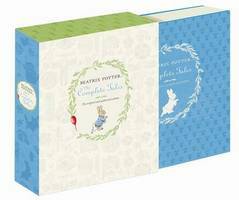 A perfect gift to introduce children to the world of Beatrix Potter, The Complete Tales is a timeless and classic essential for any nursery shelf. This complete and unabridged collection contains all 23 of Beatrix Potter's tales in one deluxe volume with all their original illustrations. The tales are arranged in the order in which they were first published. This edition includes a section at the end that contains four additional works by Beatrix Potter that were not published in her lifetime. The stories inside are: The Tale of Peter Rabbit, The Tale of Squirrel Nutkin, The Tailor of Gloucester, The Tale of Benjamin Bunny, The Tale of Two Bad Mice, The Tale of Mrs. Tiggy-Winkle, The Tale of The Pie and The Patty-Pan, The Tale of Mr. Jeremy Fisher, The Story of A Fierce Bad Rabbit, The Story of Miss Moppet, The Tale of Tom Kitten, The Tale of Jemima Puddle-Duck, The Tale of Samuel Whiskers, The Tale of The Flopsy Bunnies, The Tale of Ginger and Pickles, The Tale of Mrs. Tittlemouse, The Tale of Timmy Tiptoes, The Tale of Mr. Tod, The Tale of Pigling Bland, Appley Dapply's Nursery Rhymes, The Tale of Johnny Town-Mouse , Cecily Parsley's Nursery Rhymes, The Tale of Little Pig Robinson, Three Little Mice, The Sly Old Cat, The Fox and the Stork andThe Rabbit's Christmas Party.